Mamak - Malaysian in Chinatown, Sydney - moot! A couple of weeks ago I somehow ended up on Grab Your Fork and read of her experiences at Mamak, a Malaysian restaurant in Chinatown, Sydney. Mamak is impressive for a number of reasons. The staff appear to be largely of Malaysian origin - most of them look like Uni students. The rotis are fluffy and cooked fresh and are the focus of attention as it is prepared and cooked at the very front of the restaurant. The curries accompanying the rotis are rich and true to Malaysian curry style - thin almost to the point of being watery, more savoury, and less spicy than their Indian counterparts. The giant kebab like things most Malaysian restaurants pass as satay in Sydney have about 3x the amount of meat typical of a satay stick in Malaysia and Mamak shines in this regard as their satays are small - pretty much bite size, and taste like they were done authentically on a charcoal grill (you can really tell the difference because it imparts a smokey flavour). The cendol is also well done - a nice blend of palm sugar, coconut milk, not overly sweet and their green noodley things are pleasantly soft. Probably the most interesting thing for me was the roti tisu - made of the same dough as a roti canai but coated with a thin layer of sugar to give it a stiffness that allows it to be shaped into the cone shape pictured. Its crispy sweetness blends beautifully with the rich savoury curries served alongside. A word of advice - the place is insanely popular and if you turn up during peak hour you'lll probably be waiting 20-30 minutes for a table. You can't book either. Probably best to either turn up right at opening time, or maybe after 10pm! Its a tad disappointing as a diner but good to see that they are doing well. I hope they're able to find larger premises because they really do serve fantastic food and Malaysian cuisine is under represented. 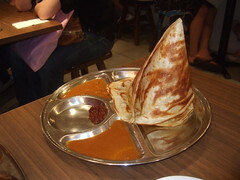 \n\nProbably the most interesting thing for me was the roti tisu - made of the same dough as a roti canai but coated with a thin layer of sugar to give it a stiffness that allows it to be shaped into the cone shape pictured. Its crispy sweetness blends beautifully with the rich savoury curries served alongside.\n\nAt \$5 for a roti canai its about 10x the price of the equivalent in Malaysia but hey, we're not in Malaysia are we? :) Price wise you can quite happily make a satisfying meal on \$15-20 so overall its not an expensive experience. 2 rotis, or 1 roti and a nasi lemak, and a dessert either chendol or ais kacang would \"suffice\". :)\n\nA word of advice - the place is insanely popular and if you turn up during peak hour you'lll probably be waiting 20-30 minutes for a table. You can't book either. Probably best to either turn up right at opening time, or maybe after 10pm! Its a tad disappointing as a diner but good to see that they are doing well. I hope they're able to find larger premises because they really do serve fantastic food and Malaysian cuisine is under represented. This page contains a single entry by goosmurf published on January 16, 2008 10:17 PM. Breaking down the sub-prime mess was the previous entry in this blog. ASX: Wiped Out is the next entry in this blog.